"It's every emotion bundled up in one," said Brian Leetch after experiencing his first  and only  Stanley Cup championship in 1994. The city of New York hadn't witnessed a Stanley Cup championship since 1940. More than a half-century of waiting came to an end (at last) with the Rangers' squad of 1994. "We definitely weren't the most talented team that ever won the Stanley Cup," admitted Leetch. "We had a nucleus that worked well together  (Mike) Richter in goal, myself and (Jeff) Beukeboom on defence, then we had (Adam) Graves and (Mark) Messier up front. We had terrific role players right up and down the line-up  big-time players in Esa Tikkanen, Craig MacTavish, Glenn Anderson, Eddie Olczyk, Brian Noonan and Stephane Matteau. The pieces all fit together." Curiously, seven players on that 1994 Rangers' squad had played with the Edmonton Oilers in 1990 when they won their fifth Stanley Cup -- Anderson, Beukeboom, Graves, Kevin Lowe, MacTavish, Messier and Tikkanen. The Rangers blanked the rival Islanders in four straight games, and had marginally more trouble with the Washington Capitals, eliminating them in five. The New Jersey Devils posed a more serious threat to the Rangers, but while it took seven games, the Rangers had earned a berth in the Stanley Cup Final, their first since 1979. The Final featured the Rangers and Vancouver's Canucks, and it was an exceptionally close -- and exciting - series. Vancouver took the first game but New York roared back and won the next three. 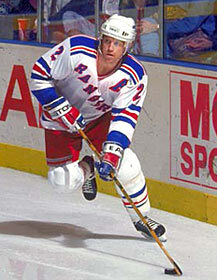 Game Four was the Brian Leetch show, as the Rangers' defenceman scored a goal and assisted on three more in the 4-2 New York win. Vancouver rebounded to tie the series, forcing a seventh and deciding game, but the Rangers edged the Canucks in that game at Madison Square Garden on June 14, 1994. The 3-2 win, with Leetch scoring the opening goal, gave the Rangers the series ... and the Stanley Cup! 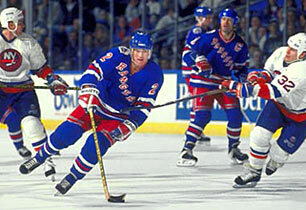 Brian Leetch led the Rangers in scoring in that Final, scoring 5 goals and 6 assists for 11 points. 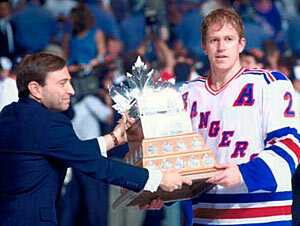 Leetch was chosen as the winner of the Conn Smythe Trophy as the most valuable player in the playoffs of 1994. "To win the Cup in '94 after a 54-year drought, that just kind of cements you as a New Yorker," Brian commented.